In my experience so far, one of the main challenges of finding that right work-life balance is related to food. It’s about finding (and taking!) the time to make good food and feed myself well. That’s why there’s a whole section dedicated to food on this blog. For years, I depended on fast, quick (read: processed options). The first time that I looked at a food label was at the pet store. It was around Christmas, when typical treats for dogs suddenly become red and green. It occurred to me to check the label for food dye, and sure enough there it was. Red # whatever. It was the exact same bone as the non-holiday type, but with the added dye. That seemed absurd to me. Why would I poison my dog, just because it looked more festive? He wouldn’t even know or care that it looked different. It was my responsibility to take care of him, and so from that moment on I began to read the labels for his treats and be strict about what I put in his little, fragile body. Sure enough, so much of what I had been feeding him didn’t make the cut when I read the labels, including fun treats that looked like colorful cookies. I used to love to buy them, and he used to love to eat them! I became diligent about it, only choosing treats and food with minimal ingredients that made sense. It took a surprisingly long time, a few months really, before I made the connection between what I was doing for Minjay and what I should do for myself, for my own body. Standing in the aisle of the supermarket, I reached out for a box of processed something or the other, most likely a “healthy Breakfast” option. Just like it suddenly occurred to me at the pet store months earlier, something in me said, “If you look at the labels of Minjay’s food, why don’t you look at your own?” Maybe I had just been at the pet store right before the supermarket, and so the link was finally established in my mind. That was really the beginning of it all. The first baby step, on a journey back to real, good food. It was a long and slow process. There was a lot (a lot!) of trial and error. I began to be more aware. Read more labels. Pay more attention. Cook more. And seek out information. Along the way, I began to learn that some foods and drinks just weren’t good for me. The first thing to go was caffeine. I read that coffee can actually make you more tired. Feeling low on energy all the time, I decided to give it a try. After cutting out caffeine and going through the horrible few days of withdrawal, I began to feel so great, better than I had in ages, with more energy than I could remember in recent years. I began to wonder, what else should I not be putting in my body? What else is causing energy slumps? I was starting to see, more vividly, the link between food, my energy and my lifestyle. Then, over two years after the pet store incident, I came across a book called The Hormone Reset Diet by Dr. Sara Gottfried. It seemed to confirm what I was starting to suspect. Food itself was causing a lot of my problems with food. It was a visious cycle of being tired, eating, and being tired. I tried out Dr. Gottfried’s 21-day reset, and I loved the results and how I felt. I had more energy than ever. I was talking to a neighbor, a physician, about my experiments with food and eating well, and he suggested that I read “It Starts With Food” by Melissa and Dallas Hartwig. I was blown away. I felt like I was in the 6th Grade again, or whatever grade you first learn about nutrition and how organisms consume things to make energy, relearning the basic. It all confirmed what I had started to know, lack of energy was mostly due to not getting the right energy from food. It was so obvious, but I had missed it, and forgotten about it, for years. I had done everything else: sleep 7-8 hours, pace myself, try not to stress… Food was the missing link. Reading these 2 books back-to-back and slowly beginning to eat in the healthy ways they explained felt revolutionary to me, like I was discovering for the first time in many ways, and in some ways rediscovering, how to eat. It takes a lot of effort to eat well. To plan. Prepare. Buy groceries. And cook every night. But so far it’s been worth it. Especially because of the easy and common sense recipes in both books. Before, I had tried so many elaborate recipes that failed that I had started to dislike cooking. But these books’ recipes were not only simple and easy, but took such little time. It began to take me 30 minutes to make a delicious, filling meal that I could eat so much of, instead of just a salad and grilled chicken… or canned soup. 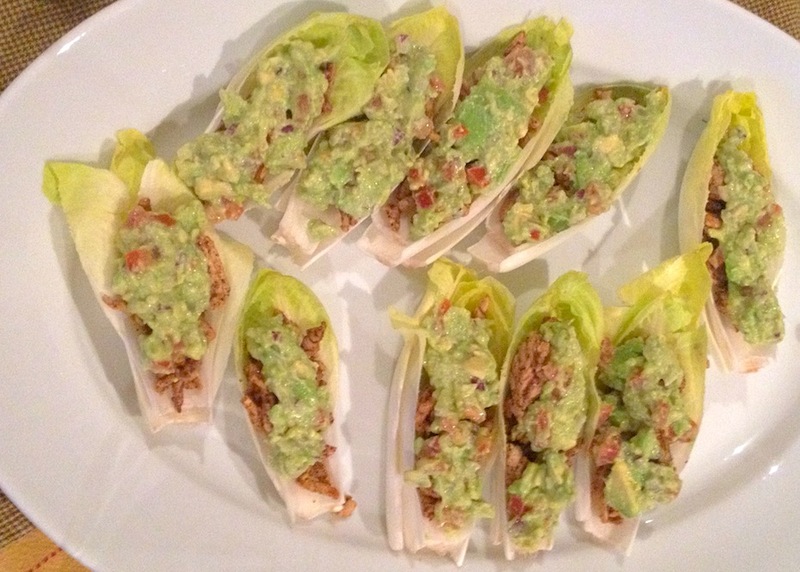 One of the first such recipes I discovered this spring was from Dr. Sara’s Hormone Reset Diet: Turkey Endive Roll Ups. I modified them a bit based on the ingredients I had at home (which both books recommend you do to keep it simple), added my own favorite, super simple guacamole recipe, and really had a feast. I made this again last Saturday night and timed myself. The whole thing, including defrosting one pound of ground turkey, took exactly 25 minutes (with the dishes used for prep, the pans and cutting board washed!) I highly recommend it. So here it is, my first recipe shared on this blog. I hope it’s helpful in your search for balanced evenings after work and finding the time to eat well. Heat 2 tbsps of coconut oil in a large skillet over medium heat. Add 1 pound of your choice of meat: ground turkey, ground beef or shredded chicken. I love using Turkey in this recipe because it goes well with the spices and gives me a night off from having red met. Sprinkle the seasonings and stir well, breaking up the ground meat. Cook until well-browned. Around 7-8 minutes for turkey and 8-9 minutes for beef. While the meat is cooking, make the guacamole and do the dishes! Mash the avocadoes in a bowl with a potato masher. You can use a fork here, but I find the masher to create a great texture. Add the tomato, green onion, garlic and lime juice, with salt and pepper to taste. You can always add lime juice based on your preference. Wash the endive and use the outer leaves, which tend to be larger. (Leave the smaller ones aside and use them in your salad the next day.) Place 2 leaves inside of each other to create a sturdy shell, then spoon in the ground meat and top it off with guacamole generously. Let me know if you have any questions in the comments section below, and share your favorite quick and easy dinner recipes too! Me and my family love Tacos and this was a very delicious recipe for dinner, thanks for sharing we love what you have acquired here. So glad to hear that, thank you for reading!